Download the hi-res version of the logo. Engineers at the Clark School have re-created the University of Maryland, College Park, logo using fluorescent glowing E. coli bacteria. They assembled the cells using programmable localized hydrogels. 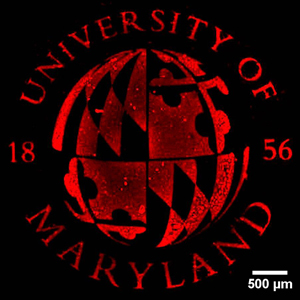 The creation of the University of Maryland logo was a demonstration of the team's ability to use programmable biofabrication to put living cells where they want to. Much of bioengineering is aimed at studying cells and their interactions. By being able to place and maintain live cells in specific locations within a chip, researchers can better understand bacterial infection and antibiotic resistance, and develop new techniques for clinical diagnosis, tissue regeneration, and personalized medicine. The researchers involved with this project are part of a group called the Maryland Biochip Collaborative, which is focused on understanding and re-engineering the way biomolecules and cells interact so that they can make major contributions to biomedicine and biotechnology. They design microfluidic "chips" on which to place cells and biomolecules in specific locations to be able to "watch" their interactions. Based at the University of Maryland, College Park, the Biochip Collaborative is made up of researchers from the Fischell Department of Bioengineering, the Department of Materials Science and Engineering, Department of Electrical and Computer Engineering, and the Institute for Systems Research at the A. James Clark School of Engineering on the University of Maryland, College Park, campus; the Institute for Bioscience and Biotechnology Research; and from the School of Pharmacy on the University of Maryland, Baltimore campus. The group is funded by multimillion-dollar grants from the Robert W. Deutsch Foundation, the National Science Foundation and the U.S. Department of Defense.